MAPublisher allows you to produce the best quality maps possible in the most efficient and accurate manner. MAPublisher does just that by allowing you to use the powerful and vast design tools of the major vector graphics applications, Adobe Illustrator and Macromedia FreeHand, in order to produce maps from geographic information systems (GIS) map data. 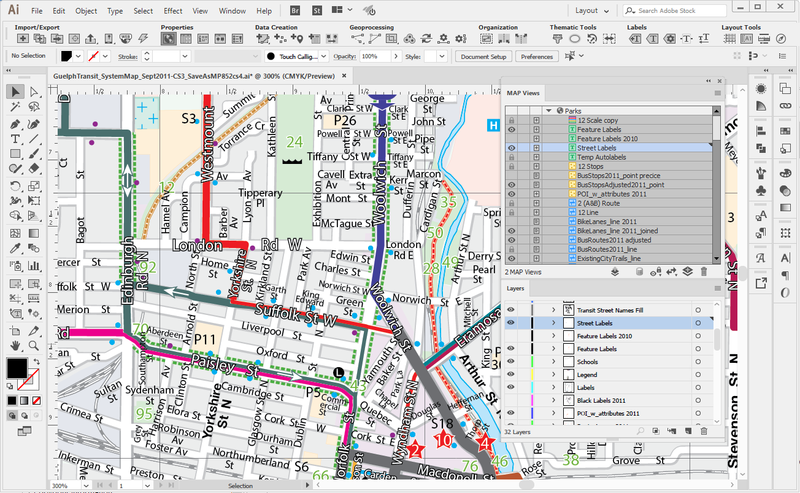 MAPublisher is a suite of plug-ins for Adobe Illustrator and Macromedia FreeHand that bridges the gap between Geographic Information System (GIS) technology and high-end graphics software for high quality and efficient design and production of maps. Cartographic quality map production is now faster, easier and better. Avenza understands that completing cartographic tasks is best performed in the right environment such as a powerful graphics program like Adobe Illustrator or Macromedia FreeHand. MAPublisher takes you into this environment seamlessly and effortlessly with the right GIS data management tools to facilitate the map production process. Using this fast, intuitive system, your map can transcend the ordinary and become a work of art. With the wealth of map data that abounds these days, both free and commercial, there is no longer the need to scan, trace or hand-draw a map. MAPublisher simplifies the entire process and allows you, the GIS professional, cartographer or graphic designer, to concentrate on the look, feel and layout of your map rather than the intricate details of geographic accuracy. MAPublisher is used worldwide by major government, academic and business organizations such as: The United States Geological Survey, UK Ordnance Survey, University of Tennessee and National Geographic. Next story PDF Expert 2.4.21 – Read, annotate, fill, and sign PDFs. Previous story Apeaksoft Data Recovery 1.0.12 – Data recovery tool. iScrapbook 7.0.4 – Design and print beautiful scrapbooks. SketchUp 16.2 – Create 3D design concepts.